A few years ago I was asked by Titan books to go along with a colleague of mine, Nick Jones, to catalog the illustrations and memorabilia that Dave Gibbons had collected and kept since the creation of Watchmen. This was to be compiled into a book which would be entitled ‘Watching the Watchmen’. Nick was just leaving Titan at the time, so this would be one of his last tasks for the company and what a nice thing to be asked to do in your final week. Nick and I met at the station and drove towards Dave Gibbon’s studio in a quiet part of a small town. When we arrived Dave greeted us and offered us drinks. My first impression of him was how very down to earth and nice he was. As we sorted through the carefully kept and rather coveted trinkets of roughs, awards and finished art, Dave narrated stories attached to the various collections and I started to get an idea that this would make a wonderful series of videos. I was sure his fans would want to hear all the great details he was conveying to us. I suggested to Dave that I could maybe come back at a later date and film him talking about the different elements of the book. He agreed that it was definitely something that would be of interest, but we had to run it by Titan first. By now the book had been published and the film based on the book was on general release. 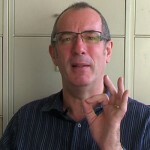 I got the call to confirm they would like me to shoot a number of short interviews with Dave Gibbons. I was delighted. I returned on my own this time and was again greeted by a very hospitable Dave Gibbons at the door. I have never since filmed an interview with such ease. 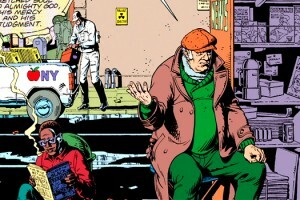 Dave Gibbons knew the subject matter so well and was so relaxed that we breezed through the shoots. 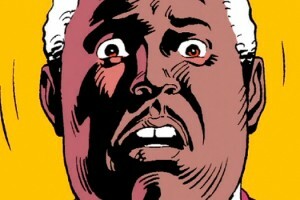 There are professional actors that would need more takes than this guy! 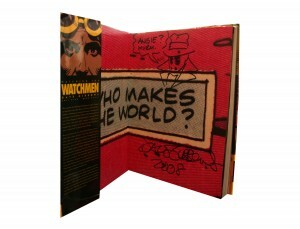 We wrapped up and Dave insisted on signing a copy of the then recently released Watching the watchmen book, published by Titan, which was a nice bonus and surprise. We had started the filming at around nine and I had in my mind that I needed to post a letter before I left, when I mentioned this upon leaving and asked Dave where the nearest post box was, he offered to walk it there himself. Like I said at the top of this blog, what a genuinely nice person! I remember meeting Dave Gibbons to be a thoroughly interesting and enjoyable experience from the very beginning to the end.